This zafu is hand made with extra strong 100% cotton fabric, a triple sewing and a white ribbon to write your name on. Large zafus are recommended for tall or overweight people. A good basis represents a great investment to be able to meditate for a long time in a comfortable and relax way. The zafu allows you to take care of your posture and of your body and mind. As your hips get higher, your posture is straighter and your spine is upright, without tension. At the beginning, you may find that your zafu is a bit hard; do not worry about it, it will quickly get the right firmness while using it. Kapok is the original stuffing used to make zafus in Japan; it has the perfect firmness to meditate comfortably for hours. The microfiber kapok is made of is hollow like a cane and covered with an oily layer. This makes it lighter than cotton and almost completely waterproof and free from bugs. In case it becomes compacted over time, you can let it in the sun for a while and your zafu will get its shape back. One of the fold is not fully sewn so that you could fill it with extra kapok at some point. To clean your zafu, brush the fabric or use the hoover; stains can be removed by rubbing with a wet rag. 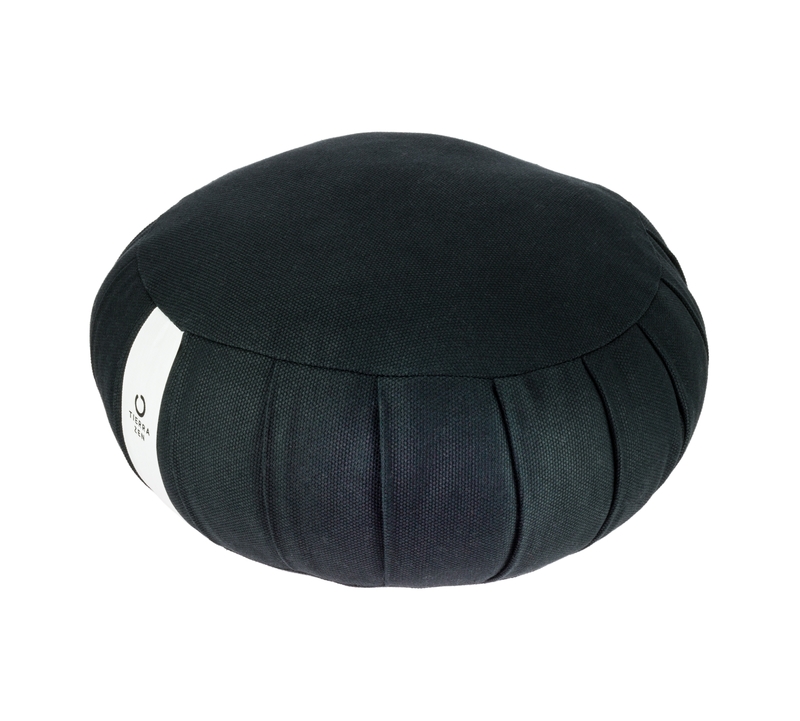 This meditation cushion is consciously made in Spain and we are proud to offer you a free extended 10-year guarantee for it. Click here for full guarantee conditions. The zabuton used to protect your knees and ankles is also available with the same colour. 35 cm Ø, 21 cm high, 100% cotton fabric, filled with 100% natural kapok. Supplied with a bag to carry it.